Direct Targeted Quantitative Molecular Imaging of Neurotransmitters in Brain Tissue Sections. Shariatgorji M, Nilsson A, Goodwin RJ, Källback P, Schintu N, Zhang X, Crossman AR, Bezard E, Svenningsson P, Andren PE. Neuron. 2014 Nov 19;84(4):697-707. doi: 10.1016/j.neuron.2014.10.011. Epub 2014 Nov 6. Quantifier les neurotransmetteurs directement sur le tissu avec la précision anatomique c’est possible! The team of Erwan Bezard, in collaboration with Per Andren (University of Uppsala, Uppsala) et Per Svenningsson (Karolinska Institute, Stockholm), has achieved a long-awaited result: the direct quantification of multiple neurotransmitters on brain sections while keeping the anatomical accuracy. Using a technique developed by Richard Caprioli (Vanderbilt University, Nashville), they applied MALDI mass spectrometry (MS) imaging for direct molecule-specific compound detection, distribution mapping, and identifying molecular species in brain tissue sections. They achieved simultaneous imaging and quantitation of multiple neurotransmitters, precursors, and metabolites, such as tyrosine, tryptamine, tyramine, phenethylamine, dopamine, 3-methoxytyramine, serotonin, GABA, glutamate, acetylcholine, and L-alpha-glycerylphosphorylcho- line, in histological tissue sections at high spatial resolutions. The method is employed to directly measure changes in the absolute and relative levels of neurotransmitters in specific brain structures in animal disease models and in response to drug treatments, demonstrating the power of mass spectrometry imaging in neuroscience. It paves the way to large scale quantification in disease models on the very same experimental groups than those used for other quantitative or qualitative approaches. Wireless Neurosensor for Full-Spectrum Electrophysiology Recordings during Free Behavior. Yin M, Borton DA, Komar J, Agha N, Lu Y, Li H, Laurens J, Lang Y, Li Q, Bull C, Larson L, Rosler D, Bezard E, Courtine G, Nurmikko AV. De Sherrington à nos jours: comprendre le contrôle cortical de la locomotion. 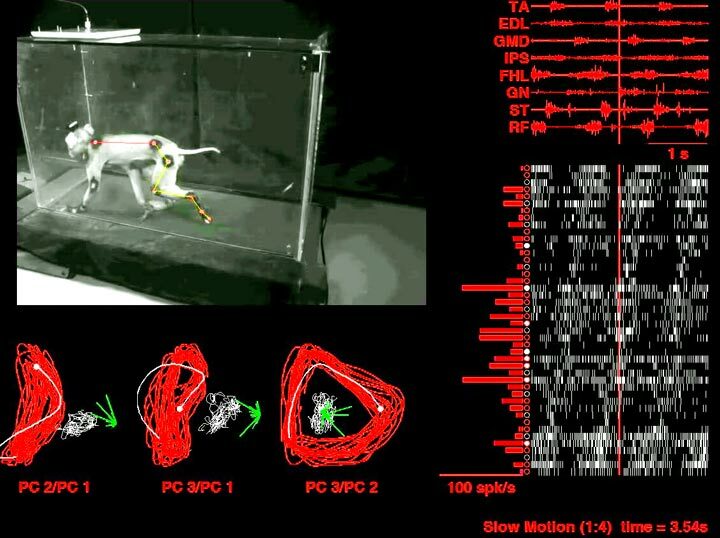 The team of Erwan Bezard, in collaboration with Arto Nurmikko (Brown University, Providence) et Grégoire Courtine (EPFL, Lausanne), has participated to the set-up of a locomotor platform in the freely-behaving non-human primate. In Bezard’s chinese branch of IMN, they have combined the study of motor cortex electrophysiological together with electromyographic activity of the cortically-controlled muscles and the global kinematic parameters of locomotion of macaque monkeys involved in freely-moving behaviour. While former methods authorized researchers to investigate animals performing tasks in restrained conditions, they now access to the spontaneous, ecological, motor behaviour of the macaque monkey. The unsurpassed broadband high-fidelity wireless neurosensing during free behavior is a technological and scientific breakthrough allowing them to decode cortical activity and to predict the macaque behaviour. The findings (and the technology) paves the way to the development of closed-loop brain-machine interface for restoring locomotor behaviour in motor disorders (Parkinson’s disease, spinal cord injury, etc..).